Today is the ninety-eighth anniversary of Our Lady's sixth and final apparition to Jacinta and Francisco Marto and Lucia dos Santos that began on May 13, 1917. The Church Militant on earth and the world-at-large continues to suffer greatly as the errors of Russia, exemplified in this country by the policies and beliefs of the false opposites of the naturalist "right" and the naturalist "left," prepare the way ever more for the ultimate battle between the forces of Our Blessed Lord and Saviour Jesus Christ and Antichrist, who has figures aplenty walking the earth at this time. As noted a few years ago now in Finding Conciliarism's Irreducible Minimum At Long Last, part one, Angelo Roncalli/John XXIII examined the Third Secret of Fatima in 1960 and simply scoffed at it as "not for our times." He disobeyed the Mother of God, who had instructed that it be opened in 1960. An unremitting warfare has been waged by the conciliar revolutionaries from that time to the present in an effort to deconstruct, misrepresent and distort Our Lady's Fatima Message, which is nothing other than Heaven's Peace Plan. Why would these revolutionaries have waged such a relentless war if Our Lady's Fatima Message did not apply directly to their revolution against Catholic Faith, Worship and Morals? This war has been waged precisely because each of them is imbued with the spirit of Modernity, which is suffused with the errors of Russia that are catalogued in part one of today's republished articles, . The conciliar revolutionaries are the very agents of the errors of Russia, which the cloak in the language Modernism and its latter day "new theology." “Moreover, all that is permitted among Protestants, even if only in one sect, must be authorized among Catholics, that is the remarriage of divorcees, polygamy, contraception and euthanasia.” . . . .
What did Pope Pius XII do after he discovered Montini's betrayal? Made him Archbishop of the Milan, the chief industrial city in Italy and a hotbed of Communism. This was supposedly a "demotion" to take Montini out of the papal pipeline. One of the first things Angelo Roncalli did, however, was to promote Giovanni Battista Enrico Antonio Maria Montini/Pau the Sick to the College of Cardinals. Who made Roncalli a cardinal? Pope Pius XII, the Pastor Angelicus. These are the mysteries of iniquity. There were equivalents of "AA-1025" in Western universities and professional schools, waiting to climb up the ranks in order to poison the minds of the young and to shape a veritable "new world order" that has given us the likes of those who trained Barack Hussein Obama/Barry Soetoro and his claque of handlers, especially Valerie Jarrett. That the "mainstream media" is composed mostly of kindred spirits to our reigning caesar and his toadies is no accident, nor is it any accident that between two-fifths and one-half of Americans of voting age are imbued with some kind of bent, however ill-defined and inchoate, in the direction of the false opposite of "naturalism." The ranks of chancery offices and of the administrative offices of the so-called United States Conference of Catholic Bishops is filled to the rafters with such kindred spirits, who are, of course, also to be found in conciliar universities and seminaries and schools and and "religious education" programs that are replete with various offshoots of the errors of Russia. This did not happen overnight. Indeed, as noted in Remember, the Queen of the Most Holy Rosary Does Not Act On Her Own, the errors of Russia did not start with Bolshevism. They started with the errors of Photius, that is, of Orthodoxy, of the overthrow of the Church in favor of making her the servant of the civil state, a rejection of Papal Primary and of many other doctrines contained in the Deposit of Faith that would lead five hundred years later to Martin Luther's own revolution against the Catholic Church that unleashed the forces of hell in the world. The ironic part of what Luther wrought, though, is that the forces of hell he released unwittingly gave impetus to the naturalism that began to surface during certain phases of the Renaissance that are being used by the devil today to destroy all false religions, including his own and that of the conciliar church that has sought to "reconcile" itself with it, for the rise of Antichrist himself. Even Judeo-Masonry and Marxism will give way in turn to Antichrist, who had plenty of assistance at the "Second" Vatican Council and has had great assistance thereafter from the "magisterium"of the counterfeit church of conciliarism. The counterfeit church of conciliarism wasted no time in turning a policy of failed diplomacy into one of outright surrender to the forces of Soviet Communism. In preparation for the Council, Catholic bishops around the world were polled by mail by the Office of the Secretariat to learn their opinions on topics to be considered at the Council. Communism topped the list. However, as documented in the previous chapter, at the instigation of Cardinal Montini, two months before the opening of the Council, Pope John XXIII approved the signing of the Metz Accord with Moscow officials, whereby the Soviets would permit two representatives from the Russian State Church to attend the Council in exchange for absolute and total silence at the Council on the subject of Communism/Marxism. Why didn’t the last Ecumenical Council condemn Communism? A secret accord made at Metz supplies an answer. Those who pass by the convent of the Little Sisters of the Poor in Borny - on the outskirts of the French city of Metz - never imagine that something of transcendental importance occurred in the residence of Fr. Lagarde, the convent’s chaplain. In a hall of this religious residence in August 1962 - two months before Vatican Council II opened - a secret meeting of the greatest importance between two high-ranking personalities took place. One dignitary was a Cardinal of the Curia, Eugène Tisserant, representing Pope John XXIII; the other was metropolitan Nikodin, who spoke in the name of the Russian Schismatic Church. This encounter had consequences that changed the direction of Council, which was already prepared to open. In effect, the meeting at Metz determined a change in the trajectory of the very History of the Church in the 20th century. What was the matter of such great importance that was resolved at his meeting? Based on the documents that are known today, there it was established that Communism would not be condemned by Vatican Council II. In 1962, The Vatican and the Schismatic Russian Church came to an agreement. According to its terms, the Russian “Orthodox Church” agreed to send observers to Vatican II under the condition that no condemnation whatsoever of communism should be made there (1). 1. Ulysses Floridi, Moscou et le Vatican, Paris: France-Empire, Paris, 1979, pp. 147-48; Romano Amerio, Iota Unum, K.C., MO: Sarto House, 1996, pp. 75-76; Ricardo de la Cierva, Oscura rebelion en la Iglesia, Barcelona: Plaza & Janes, 1987, pp. 580-81. And why were the consequences of such a pact so far-reaching and important? Because in the 20th century a principal enemy of the Catholic Church was Communism. As such, until Vatican II it had been condemned numerous times by the Magisterium. Moreover, in the early ’60s a new condemnation would have been quite damaging, since Communism was passing through a serious crisis, both internally and externally. On one hand, it was losing credibility inside the USSR since the people were becoming increasingly discontent with the horrendous administrative results of 45 years of Communist demagogy. On the other hand, outside the USSR Communism had not been able to persuade the workers and poor of free countries to take up its banner. In fact, up until that time it had never won a free election. Therefore, the leaders of international Communism decided that it was time to begin to change the appearances of the regime in order to retain the power they had and to experiment with new methods of conquest. So in the ‘60s President Nikita Khrushchev suddenly began to smile and talk about dialogue (2). 2. Plinio Correa de Oliveira, Unperceived Ideological Transshipment and Dialogue, New York: Crusade for a Christian Civilization, 1982, pp. 8-15. This would have been a particularly inopportune moment for the Pope or the Council to issue a formal condemnation, which could have either seriously damaged or possibly even destroyed the Communist regime.. Speaking about the liberty at Vatican II to deal with diverse topics, Professor Romano Amerio revealed some previously unpublished facts. “The salient and half secret point that should be noted,” he stated, “is the restriction on the Council’s liberty to which John XXIII had agreed a few months earlier, in making an accord with the Orthodox Church by which the patriarchate of Moscow accepted the papal invitation to send observers to the Council, while the Pope for his part guaranteed the Council would refrain from condemning Communism. The negotiations took place at Metz in August 1962, and all the details of time and place were given at a press conference by Mgr. Paul Joseph Schmitt, the Bishop of that Diocese [newspaper Le Lorrain, 2/9/63]. The negotiations ended in an agreement signed by metropolitan Nikodim for the Orthodox Church and Cardinal Tisserant, the Dean of the Sacred College of Cardinals, for the Holy See. “Moscow’s condition, namely that the Council should say nothing about Communism, was not, therefore, a secret, but the isolated publication of it made no impression on general opinion, as it was not taken up by the press at large and circulated, either because of the apathetic and anaesthetized attitude to Communism common in clerical circles or because the Pope took action to impose silence in the matter. Nonetheless, the agreement had a powerful, albeit silent, effect on the course of the Council when requests for a renewal of the condemnation of Communism were rejected in order to observe this agreement to say nothing about it” (3). 3. Romano Amerio, Iota Unum, pp. 65-66. Thus the Council, which made statements on capitalism and colonialism, said nothing specific about the greatest evil of the age, Communism. While the Vatican Monsignors were smiling at the Russian Schismatic representatives, many Bishops were in prison and innumerable faithful were either persecuted or driven underground for their fidelity to the Holy Roman Catholic Church. It was in our region that the ‘secret’ meeting of Cardinal Tisserant with archbishop Nikodin occurred. The exact place was the residence of Fr. Lagarde, chaplain for the Little Sister of the Poor in Borny [on the outskirts of Metz]. Here for the first time the arrival of the prelates of the Russian Church was mentioned. After this meeting, the conditions for the presence of the Russian church’s observers were established by Cardinal Willebrands, an assistant of Cardinal Bea. Archbishop Nikodin agreed that an official invitation should be sent to Moscow, with the guarantee of the apolitical character of the Council” (4). 4. 30 Dias, October 1988, pp. 55-56. In a book published some time after this, German theologian Fr. Bernard Häring - who was secretary-coordinator at the Council for the redaction of Gaudium et Spes - revealed the more profound reason for the ‘pigeon-holing’ of apetition that many conciliar Fathers signed asking Paul the Sick and the Council to condemn Communism: “When around two dozen Bishops requested a solemn condemnation of Communism,” stated Fr. Häring, “Msgr. Glorieux …. and I were blamed like scapegoats. I have no reason to deny that I did everything possible to avoid this condemnation, which rang out clearly like a political condemnation. I knew that John XXIII had promised Moscow authorities that the Council would not condemn communism in order to assure the participation of observers of the Russian Orthodox church” (6). . . .
1. Catholic doctrine has always emphatically condemned Communism. It would be possible, should it be necessary, to publish a small book composed exclusively of anti-communist pontifical documents. 2. It would have been natural, therefore, for Vatican Council II, which met in Rome from 1962 to 1965, to have confirmed these condemnations against the greatest enemy of the Church and Christian Civilization in the 20th century. 3. In addition to this, 213 Cardinals, Archbishops, and Bishop solicited Paul the Sick to have the Council make such a condemnation. Later, 435 Conciliar Fathers repeated the same request. The two petitions were duly delivered within the time limits established by the Internal Guidelines of the Council. Nonetheless, inexplicably, neither petition ever came up for debate. The first was not taken into consideration. As for the second, after the Council had closed, it was alleged that it had been “lost” by Mgr. Achille Glorieux, secretary of the commission that would have been entrusted with the request. Giovanni Montini/Paul the Sick engaged in a policy of Communist surrender known as Ostpolik (East politics) wherein he appointed men as "bishops" in Communist countries behind the Iron Curtain who were friendly to, if not actual agents of, the Communist authorities in those countries. These "bishops" had a perverse "apostolic mandate," if you will, given then sub secreto by Montini: never criticize Communism or any Communist officials. In other words, be good stooges for various "people's" and "democratic" republics in exchange for promoting the false "gospel" of conciliarism. It was also Montini/Paul the Sick who sold out the courageous Jozsef Cardinal Mindszenty, the Primate of Hungary and the Archbishop of Budapest, Josef Cardinal Mindszenty when the latter, after taking refuge in the American Embassy in Budapest for a decade following the Hungarian Revolution in October of 1956, was forced out of the American Embassy as a result of Vatican pressure and then, after being told by Montini/Paul the Sick that he remained as the Archbishop of Budapest, has his primatial see declared vacant by the theologically, liturgically and morally corrupt Montini. The Prisoner, as it happened, was wrapped too soon because Mindszenty's story, which had seemed to be fini, had scarcely begun. By 1956 Stalin was dead and Khrushchev was making some unusual noises. In October the Hungarians rose in revolt. Mindszenty had no clue of what was happening on the street; his guards told him that the rabble outside the prison was shouting for his blood. A few days later he was released and indeed a mob of locals set upon him. But instead of ripping his flesh they grabbed at the liberated hero to kiss his clothes. When he returned to Budapest the deposed Reds quivered over this ghost who would not stay buried, but in a radio broadcast he counseled against revenge. The Soviets were not so forgiving, and tanks rumbled to crush this unpleasant incident. A marked man, Mindszenty sought asylum in the American embassy as his last resort. Now a second long Purgatory had begun. Pius spoke out repeatedly against this latest example of Soviet terror but the West, heedless of its own liberation rhetoric, was deaf. When The Prisoner was released, the Church was still the implacable foe of communism. Frail Pius stood as a Colossus against both right and left totalitarianism. When Pius departed this world there ensued a moral void in the Vatican that has never been filled. By the early 1960s both the Western governments and the Novus Ordo popes decided that accommodation with the Communists was preferable to the archaic notions of Pius and Mindszenty. John XXIII and successor Paul the Sick welcomed a breath of fresh air into the Church, and that odor included cooperation with the Reds. The new Ostpolitik, managed by Paul's Secretary of State Agostino Casaroli, hadn't room for Christian warriors of Mindszenty's stamp. The position of the Hungarian government was strengthened when Casaroli entered negotiations with the appalling regime of Janos Kadar. As the Cold War thawed, the freeze was put on Mindszenty. The American government made it understood that he was no longer welcome at the embassy. Worse still, Paul sent a functionary to persuade Mindszenty to leave, but only after signing a document full of stipulations that favored the Reds and essentially blaming himself for his ordeal. The confession that the Communists could not torture out of him was being forced on him by the Pope! Driven from his native land against his wishes, Mindszenty celebrated Mass in Rome with Paul on October 23, 1971. The Pope told him, "You are and remain archbishop of Esztergom and primate of Hungary." It was the Judas kiss. For two years Mindszenty traveled, a living testament to truth, a man who had been scourged, humiliated, imprisoned and finally banished for the Church's sake. In the fall of 1973, as he prepared to publish his Memoirs, revealing the entire story to the world, he suffered the final betrayal. Paul, fearful that the truth would upset the new spirit of coexistence with the Marxists, "asked" Mindszenty to resign his office. When Mindszenty refused, Paul declared his See vacant, handing the Communists a smashing victory. If Mindszenty's story is that of the rise and fall of the West's resistance to communism it is also the chronicle of Catholicism's self-emasculation. In the 1950s a man such as Mindszenty could be portrayed as a hero of Western culture even though both American and English history is rife with hatred toward the Church. When the political mood changed to one of coexistence and detente rather than containment, Mindszenty became an albatross to the appeasers and so the Pilates of government were desperate to wash their hands of him. Still, politicians are not expected to act on principle, and therefore the Church's role in Mindszenty's agony is far more damning. As we know, Joseph Ratzinger/Benedict XVI continued this program as he sold out the underground Catholics in Red China (see Red Army Inside The Vatican). Jorge Mario Bergoglio is actually taking this all to the next level by embracing Communists murderers such as Fidel and Raul Castro (see "Respect and Consideration" for Fidel Castro?). There can be no room for the consecration of Russia with all of the bishops of the world for those who are immersed in the errors of Russia, which are nothing other than the twin, inter-related errors of Modernity and Modernism. Miraculous consecrations? The minds of rationalists cannot accept the miraculous. The minds of agnostics must try to "explain" everything and to discount the miraculous as little more "interior sentiments," which is precisely the method that the now retired Joseph Ratzinger/Benedict XVI used to express, although in his typically opaque manner, disbelief in the actual, physical apparitions of Our Lady in the Cova da Iria in Fatima, Portugal, ninety-five years ago. Joseph Ratzinger/Benedict XVI described himself in 2011 as a "rationalist," that is, a person who believes that it is necessary to reason things out on his own in light of alleged new verities (new truths) that man encounters as "progress" takes him to newer visions of himself and the world around him over the course of time. Rationalism is of the essence of the Protestant Revolution as it was only logical for men, having rejected the teaching authority of the true Church that Our Blessed Lord and Saviour Jesus Christ founded upon the rock of Peter, the Pope, to trust in their own "abilities" to interpret Sacred Scripture by explaining it anew with "insights" of their very own. Rationalism is, of course, at the very foundation of the so-called "Age of Reason" or "Enlightenment" that spawned so many variations of what are, when all of the complexities and intricacies are stripped away, the same naturalist theme: that God, if He exists at all, has revealed nothing definitively binding upon all men at all times and that it is therefore necessary for men to "rethink" basic presuppositions in order to "discover" the meaning of life and ways of improving man's lot here on earth. Modernism has its proximate antecedent roots in the rationalism of the Protestant Revolution, replete with all of its own complex variations that mutations, and the rationalism of the "Enlightenment" that led to reign of the "rights of man" in the place of the the rights of the Social Reign of Christ the King. 5. In order to easily mislead the people into making errors, deceiving particularly the imprudent and the inexperienced, they pretend that they alone know the ways to prosperity. They claim for themselves without hesitation the name of "philosophers." They feel as if philosophy, which is wholly concerned with the search for truth in nature, ought to reject those truths which God Himself, the supreme and merciful creator of nature, has deigned to make plain to men as a special gift. With these truths, mankind can gain true happiness and salvation. So, by means of an obviously ridiculous and extremely specious kind of argumentation, these enemies never stop invoking the power and excellence of human reason; they raise it up against the most holy faith of Christ, and they blather with great foolhardiness that this faith is opposed to human reason. 6. Without doubt, nothing more insane than such a doctrine, nothing more impious or more opposed to reason itself could be devised. For although faith is above reason, no real disagreement or opposition can ever be found between them; this is because both of them come from the same greatest source of unchanging and eternal truth, God. They give such reciprocal help to each other that true reason shows, maintains and protects the truth of the faith, while faith frees reason from all errors and wondrously enlightens, strengthens and perfects reason with the knowledge of divine matters. Rationalism is opposed to rationality. That is, rationalism, trusting in man's ability to "figure everything out for himself," leads to skepticism of the past and skepticism of most supernatural truths that rationalists believe can only be accepted if they are made "accessible" to "modern men" by adapting their expression to the exigencies of a given period in history. We have been eyewitnesses to the endless, tireless, ceaseless efforts on the part of the conciliar "popes," including Jorge Mario Bergoglio/Francis, to do precisely this without almost every facet of the Holy Faith. The conciliar "popes," puffed up with overweening pride and oozing with hubris, have told us that they know better than the true popes of the Catholic Church. The conciliar "popes" have known better than anyone else how to re-read Sacred Scripture. The conciliar "popes" have found the "true way" to re-read the Fathers of the Church. The conciliar "popes," including Joseph Ratzinger/Benedict XVI and Jorge Mario Bergoglio/Francis, have twisted the words of various saints and doctors to attempt to make them witnesses in behalf of the apostasies, blasphemies and sacrileges of his false religion, conciliarism, rejecting entirely the official philosophy of the Catholic Church, Scholasticism, going so far as to refer the philosophy employed by Saint Thomas Aquinas and endorsed by numerous popes and the fathers of the Council of Trent as "the philosophical school" of the Angelic Doctor's time. Joseph Ratzinger/Benedict XVI knows better than Pope Eugene IV and the fathers of the Council of Florence under whom Cantate Domino was issued on February 4, 1442. The conciliar "popes" have known better than Popes Benedict XIII and Saint Pius V and Clement XII and Blessed Urban V and Innocent VI and Leo XIII, each of whom endorsed the Scholasticism of Saint Thomas Aquinas as the true way by which Faith and reason work together as the creature uses the rational faculties God gave him to to see all things through the light of the Faith and to accept that we must accept that the supernatural truths revealed by Him and taught in His Holy Name by the Catholic Church can never be contradicted or understood in any other way. 8. As human reason is placed on a level with religion itself, so theological must be treated in the same manner as philosophical sciences. -- Allocution "Singulari quadam," Dec. 9, 1854. 9. All the dogmas of the Christian religion are indiscriminately the object of natural science or philosophy, and human reason, enlightened solely in an historical way, is able, by its own natural strength and principles, to attain to the true science of even the most abstruse dogmas; provided only that such dogmas be proposed to reason itself as its object. -- Letters to the Archbishop of Munich, "Gravissimas inter," Dec. 11, 1862, and "Tuas libenter," Dec. 21, 1863. 10. As the philosopher is one thing, and philosophy another, so it is the right and duty of the philosopher to subject himself to the authority which he shall have proved to be true; but philosophy neither can nor ought to submit to any such authority. -- Ibid., Dec. 11, 1862. 11. The Church not only ought never to pass judgment on philosophy, but ought to tolerate the errors of philosophy, leaving it to correct itself. -- Ibid., Dec. 21, 1863. 12. The decrees of the Apostolic See and of the Roman congregations impede the true progress of science. -- Ibid. 13. The method and principles by which the old scholastic doctors cultivated theology are no longer suitable to the demands of our times and to the progress of the sciences. -- Ibid. Propositions twelve and thirteen apply particularly to the lifelong work of the immediate past universal public face of apostasy, Joseph Ratzinger/Benedict XVI (see Sixty Years of Priestly Apostasy and Mister Asteroid Is Looking Pretty Good Right About Now), and, of course, Jorge Mario Bergoglio, who loves every religion except Catholicism--and who desconstructed Our Lady's Fatima Message but good during his visit to Fatima five months ago (see Bergoglio the Blaspheming Heretic Lives Down to Expectations at Fatima, part one and Bergoglio the Blaspheming Heretic Lives Down to Expectations at Fatima, part two). Moreover, Joseph Ratzinger/Benedict XVI's rationalism made it impossible for him to believe in the miraculous, which is why his denials of the doctrine of Transubstantiation and of Our Blessed Lord and Saviour Jesus Christ's actual, bodily Resurrection on Easter Sunday had to be cloaked with layers upon layers of his rationalistic "search for the truth." He is an incredulous man, which is why he could not accept the fact of Our Lady's actual, physical presence atop the holm oak in the Cova da Iria near Fatima, Portugal, ninety-five years ago, and it is why he found the actual Third Secret of Fatima to be as much "rubbish" as did Angelo Roncalli/John XXIII when he read it in 1960. The now retired "Petrine Minister" sought to explain his disbelief in Our Lady's actual, physical presence in Fatima in various ways, doing so in 2000 as a false version of the Third Secret was released and reiterating in no uncertain terms ten years later when he visited Portugal. It is very significant that the former "pontiff" cited his own Theological Commentary on the Fatima Message from ten years previously as he meant to convey, albeit in the obscurantist manner of a Modernist, that the Faith is purely a matter of the senses (no room for the intellect here) and that the three shepherd children had a "Light deep within them" that caused them to "see" Our Lady interiorly, meaning, of course, that she was not truly physically visible to the eyes of their bodies. And that is leaving aside the phrase "the future of God" as no true pope has ever spoken in such a absurd manner. A Catholic can speak about the future possession of the glory of the Beatific Vision of God the Father, God the Son, and God the Holy Ghost. One possessed of a Catholic mind does speak of the "future of God" as He is without beginning or end. Before undertaking an interpretation of the message of Fatima, we must still attempt briefly to offer some clarification of their anthropological (psychological) character. In this field, theological anthropology distinguishes three forms of perception or “vision”: vision with the senses, and hence exterior bodily perception, interior perception, and spiritual vision (visio sensibilis - imaginativa - intellectualis). It is clear that in the visions of Lourdes, Fatima and other places it is not a question of normal exterior perception of the senses: the images and forms which are seen are not located spatially, as is the case for example with a tree or a house. This is perfectly obvious, for instance, as regards the vision of hell (described in the first part of the Fatima “secret”) or even the vision described in the third part of the “secret”. But the same can be very easily shown with regard to other visions, especially since not everybody present saw them, but only the “visionaries”. It is also clear that it is not a matter of a “vision” in the mind, without images, as occurs at the higher levels of mysticism. Therefore we are dealing with the middle category, interior perception. For the visionary, this perception certainly has the force of a presence, equivalent for that person to an external manifestation to the senses. Interior vision does not mean fantasy, which would be no more than an expression of the subjective imagination. It means rather that the soul is touched by something real, even if beyond the senses. It is rendered capable of seeing that which is beyond the senses, that which cannot be seen—seeing by means of the “interior senses”. It involves true “objects”, which touch the soul, even if these “objects” do not belong to our habitual sensory world. This is why there is a need for an interior vigilance of the heart, which is usually precluded by the intense pressure of external reality and of the images and thoughts which fill the soul. The person is led beyond pure exteriority and is touched by deeper dimensions of reality, which become visible to him. Perhaps this explains why children tend to be the ones to receive these apparitions: their souls are as yet little disturbed, their interior powers of perception are still not impaired. “On the lips of children and of babes you have found praise”, replies Jesus with a phrase of Psalm 8 (v. 3) to the criticism of the High Priests and elders, who had judged the children's cries of “hosanna” inappropriate (cf. Mt 21:16). In other words, just as Modernists contend that Faith itself is a matter of interior consciousness that comes from within so do they believe that seers such as Saint Bernadette Soubirous and Jacinta and Francisco Marto and Lucia dos Santos have had real but necessarily "subjective" experiences that have no actual visible, spatial reality with the eyes of the body. It is important to examine the connection between the Theological Commentary on the Fatima Message of twelve years ago and the "homily" given on the Esplanade of the Shrine of Our Lady of Fátima on May 13, 2010. First, Ratzinger/Benedict made the point in 2010 that the three shepherd children of Fatima were able to "see" Our Lady because they had "these innocent and profound mystical confidences," meaning that the children had to have pure, innocent souls to see interiorly what they thought they had seen with their eyes. This corresponds exactly to what he wrote ten years ago, that "this explains why children tend to be the ones to receive these apparitions: their souls are as yet little disturbed, their interior powers of perception are still not impaired." My friends, Joseph Ratzinger/Benedict XVI did not believe that Our Lady physically appeared before the physical eyes of Jacinta, Francisco, and Lucia. He has dismissed the Fatima apparitions as an "interior vision" that are designed to move us closer to Our Blessed Lord and Saviour Jesus Christ and have nothing at all to do with apostasy in the ranks of those who believe themselves to be Catholics or, Heaven forfend, the consecration of Russia to Our Lady's Immaculate Heart by a true pope with all of the world's bishops. Ratzinger/Benedict did not believe triumph of the Immaculate Heart of Mary that he referred to gratuitously in 2010 has anything at all to do with the consecration of Russia or the conversion of souls to the true Faith, Catholicism. Why did Ratzinger/Benedict make reference to that triumph, therefore? Because it makes life easier for those in the Motu communities and for Bishop Fellay of the Society of Saint Pius X as they bask in the false reassurance that their false "pontiff" is a partisan of the Fatima Message. One cannot believe in a request of a message that conflicts with good relations with those in Russia, whether it be the Communists of yore (and the present day, of course) or the Orthodox at the present time. If what happened at Fatima was but a mere "interior vision," then why did each of the children, when being examined by ecclesiastical authorities, give identical testimony as to what they saw with the physical eyes of their bodies? Each had the identical "inner vision"? Logic has never been Ratzinger/Benedict's long suit as his rejection of Thomism (both Thomistic Philosophy and Thomistic Theology) has opened up to grow from young adulthood into an old man, who is now a "retired" antipope, who has lived in a world of contradiction, paradox and ambiguity which makes it almost impossible for to him to see the fallacies in what he presents as "explanations" of the Faith and the events associated with It. It is clear that in the visions of Lourdes, Fatima and other places it is not a question of normal exterior perception of the senses: the images and forms which are seen are not located spatially, as is the case for example with a tree or a house. This is perfectly obvious, for instance, as regards the vision of hell (described in the first part of the Fatima “secret”) or even the vision described in the third part of the “secret”. . . .
Why is it "perfectly obvious" that the images and forms seen, to cite the false "pope's own example, by the fourteen year-old Bernadette Soubirous and Jacinta, Francisco, and Lucia "are not located spatially"? Our Lady did not actually part the earth and show Jacinta, Francisco, and Lucia a vision of Hell that they saw with their own eyes? This was merely an "interior" vision vision of theirs that did not really happen in time and space? The the buds on holm oak tree over which Our Lady hovered as she physically appeared to Jacinta, Francisco, and Lucia did not change their appearance as seen by eyewitnesses who came to watch them? They were all suffering from mass delusion when they saw the following things? Preceding the second apparition, the seers once again saw a great brilliance, which they called lightning, but which was really the glare of the approaching light. Some of the approximately fifty spectators who had come to the place noticed that the light of the sun became dimmer during the first few minutes of the conversation. Others said that the top of the budding holm oak bent down, as if under the weight of something, a moment before Lucia spoke. During Our Lady's conversation with the seers, some of the bystanders heard a whispering, like the humming of a bee. When this vision ceased, the Lady, still surrounded by the light that she radiated, rose from the little tree and glided toward the east until she disappeared completely. Several persons who were closer noticed that the buds at the top of the holm oak were bent in the same direction, as if they had been drawn by the Lady's clothes. They returned to their usual position only some hours later. Mr. Marto, father of Jacinta and Francisco, says that when the third apparition began, a little grayish cloud hovered over the holm oak, the sunlight diminished, and a cool breeze blew over the mountain range, even though it was the height of summer. He also heard something that sounded like flies inside an empty jug. On 13 August, the day the fourth apparition was to take place, the seers could not go to Cova da Iria, as they had been abducted by the mayor of Vila Nova de Ourém, who wanted to force the secret from them. The children held fast. At Cova da Iria, thunder followed by lightning was heard at the usual time. The spectators noticed a small white cloud that hovered over the holm oak for a few minutes. Phenomena of coloration were observed on the faces of the people, the clothing, the trees, and the ground. Our Lady had certainly come, but she had not found the seers. A crowd estimated at twenty thousand observed atmospheric phenomena similar to those of the previous apparitions: the sudden cooling of the air, a dimming of the sun to the point where the stars could be seen, and a rain resembling iridescent petals or snowflakes that disappeared before touching the ground. This time, a luminous globe was noticed which moved slowly and majestically through the sky from east to west and, at the end of the apparition, in the opposite direction. The seers saw a light, and, immediately following this, they saw Our Lady over the holm oak. All of this did not happen? The crowd did not see what they reported? Were they having "interior visions"? Preposterous. What about the Miracle of the Sun on October 13, 1917, ninety-eight years ago today? Was the following report from a reporter for O Seculo, Avelino de Almeida, who had written pieces that were scathing in their criticism of the children's claims to have seen Our Lady, making up the following story that he wrote about what happened in the Cova da Iria near Fatima, Portugal, on October 13, 1917? One could see the immense multitude turn towards the sun, which appeared free from clouds and at its zenith. It looked like a plaque of dull silver and it was possible to look at it without the least discomfort. It might have been an eclipse which was taking place. But at that moment a great shout went up and one could hear the spectators nearest at hand shouting: "A miracle! A miracle!" Before the astonished eyes of the crowd, whose aspect was Biblical as they stood bareheaded, eagerly searching the sky, the sun trembled, made sudden incredible movements outside all cosmic laws - the sun "danced" according to the typical expression of the people. Is the testimony below about what happened on October 13, 1917, bogus? Whereas «the low and heavy sky had a very dark color, laden with moisture, released an abundant and long lasting rain,» during the time of the apparition, the rain stopped totally. Abruptly the sky cleared: «The sun triumphantly pierced the thick bed of clouds hiding it until then, and shone intensely.» (Dr. Almeida Garrett). «Suddenly I heard the uproar of thousands of voices, and I saw the whole multitude spread out in that vast space at my feet ... turn their backs to that spot where, until then, all their expectations focused, and look at the sun on the other side ... I turned around, too, toward the point commanding their gazes, and I could see the sun, like a very clear disc, with its sharp edge, which gleamed without hurting the sight ... It could not be confused with the sun seen through a fog (there was no fog at that moment), for it was neither veiled, nor dim. At Fatima, it kept its light and heat, and stood out clearly in the sky, with a sharp edge, like a large gaming table. The most astonishing thing was to be able to stare at the solar disc for a long time, brilliant with light and heat, without hurting the eyes, or damaging the retina.» (Dr. Almeida Garrett). Suddenly, the heavenly body began to tremble, to shake with abrupt movements, and finally to turn on itself at a dizzying speed while throwing out rays of light, all colors of the rainbow: «The sun turned like a fire wheel, taking on all the colors of the rainbow.» (Maria do Carmo) «It appeared like a globe of snow turning on itself.» (Father Lourenço) «The pearl-like disc had a giddy motion. This was not the twinkling of a star in all its brilliance. It turned on itself with impetuous speed.» (Dr. Almeida Garrett) «At a certain moment, the sun stopped and then began again to dance, to spin; it stopped again, and began again to dance.» (Ti Marto) It is indeed therefore a triple "dance of the sun" which thousands of witnesses affirm, having contemplated it for several minutes. «The sun took on all the colors of the rainbow. Everything assumed those same colors: our faces, our clothes, the earth itself.» (Maria do Carmo) «A light, whose colors changed from one moment to the next, was reflected on the people and on things», notes Dr. Pereira Gens. A last astonishing fact: all those people, who were for the most part soaked to the bone, verified with joy and amazement that they were dry. The fact is attested to in the canonical process. A marvelous thing, the phenomenon could be admired from beyond Fatima. And even, some perfectly credible witnesses, who were very far away from the Cova da Iria, related having seen the unprecedented spectacle of the dance of the sun, exactly like the thousands of pilgrims gathered around the holm-oak. observing the Miracle of the Sun at Fatima on October 13, 1917. In the small village of Alburitel, situated eighteen or nineteen kilometers from Fatima, the whole town was able to enjoy the vision of the solar prodigy. The testimony frequently quoted is that of Father Inacio Lourenço, because it is the most detailed. But what he relates having seen, all the good villagers, questioned by the investigators, confirmed seeing it in exactly the same way. Thus, the magnificent miracle, it is She Who promised it, Who announced it three months in advance, and at Her gesture the miracle was fulfilled. That is the reply of the Queen of Heaven to the instant supplication of Her shepherd: «I would like to ask You to tell us Who You are, and to perform a miracle so that all may believe that You are appearing to us.» A response surpassing all expectations and one of such magnitude, of such splendor, that no one would dare to dream it possible. The witnesses of the event were indeed innumerable, their testimonies agree and we are flooded with the documents they have left us. In the first place, the numerous accounts conveyed appeared at once in the Portuguese press. It is noteworthy that the first to provide testimony were the anticlerical reporters. The three articles of Avelino de Almeida, the one of October 13, immediately before the event, the other of October 15, edited at Vila Nova de Ourem on the evening of the 13th, and a third article of October 29, merit a special mention. In spite of the jeering tone and Voltarian irony which inspire in part the first article, in spite of the expected anticlerical tones which still appear in the article of the 15th. These texts from a reporter of talent, one who besides, is honest and conscientious, are historical documents of prime importance5. But he was not the only one to relate the facts, for other reporters were present at the Cova da Iria. Next there were the official investigations. In November, 1917, at the request of Bishop de Lima Vidal, who was then directing the diocese of Lisbon, the Parish Priest of Fatima led his investigation and questioned several witnesses of the parish. Unfortunately, he transcribed only... four depositions! The investigations of the historians fortunately compensated for those negligences of the official investigators. Since Father Formigao, who obtained from Dr. José Maria de Almeida Garrett, professor at the Faculty of Sciences of Coimbra, a very thorough account, the most scientific report in our possession6, all the top historians went to question the witnesses. Father da Fonseca, in order to verify the points disputed by Father Dhanis; Father De Marchi, Canon Barthas, Father Dias Coelho and Father Richard. In 1977, to commemorate the sixtieth anniversary of the last apparition, it was still possible to assemble in Fatima more than thirty persons who had been present at the solar prodigy and who could reveal their memories. Did it not actually rain? Were not the thousands of people assembled soaked to the bone with rain water? Was not the ground beneath them muddy with puddles of water aplenty? Were not the clothes of those people made completely try in an instant after the Miracle of the Sun? Was not the ground beneath made them dry as though it had never rained? For the retired Ratzinger/Benedict XVI to have contended that the Fatima seers had a "interior vision" of the "senses" that were not "located spatially" is to discount all of this evidence as so much nonsense, unworthy of even being mentioned during his first pilgrimage to Fatima five years ago as what he believed himself to be, a true and legitimate Successor of Saint Peter, the very Vicar of Our Blessed Lord and Saviour Jesus Christ on earth. It is he who is deluded, not the people who reported as one, with once voice, if you will, the experiences recounted above. The conciliarists have made war upon Our Lady's Fatima Message and her Third Secret, seeking to turn Our Lady into a witness in behalf of concilairism, precisely because they do not want to admit that that Third Secret deals with their own very apostasy as they deceive souls and blaspheme Our Lady and her own chosen souls such as Jacinta and Francisco Marto and Lucia dos Santos. It is that simple. Admitting that I am agnostic as to whether the following account of the Third Secret is real and legitimate, I would like to pose the following question to my readers? What if the account below, as has been reported on the anti-sedevacantist Tradition in Action website, accurate? Would this not explain the antipathy of the unholy trio--Joseph Ratzinger-Angelo Sodano-Tarcisio Bertone--who worked so mightily to "reinvent" the Fatima Message and to misrepresent its Third Secret? Now I am going to reveal the third fragment of the secret: This part is the apostasy in the Church! Our Lady showed us the individual who I describe as the 'holy Father' in front of a multitude that was cheering him. But there was a difference from a true holy Father, his devilish gaze, this one had the gaze of evil. Then, after some moments we saw the same Pope entering a Church, but this Church was the Church of hell; there is no way to describe the ugliness of that place. It looked like a gray cement fortress with broken angles and windows similar to eyes; it had a beak in the roof of the building. Next, we raised our eyes to Our Lady who said to us: You saw the apostasy in the Church; this letter can be opened by the holy Father, but it must be announced after Pius XII and before 1960. In the kingdom of John Paul II the cornerstone of Peter’s grave must be removed and transferred to Fatima. Because the dogma of the faith is not conserved in Rome, its authority will be removed and delivered to Fatima. The cathedral of Rome must be destroyed and a new one built in Fatima. If 69 weeks after this order is announced, Rome continues its abomination, the city will be destroyed. • the evidence from Paris Match magazine, from Sister Pasqualina, the confidential assistant of Pope Pius XII; and from Msgr. Capovilla, personal secretary to Pope John XXIII who said the Secret was held in a desk in the Pope’s apartment, which conflicts with the 2000 commentary that claims it was stored at the Holy Office. "Bertone does not answer these testimonies in his book”, says Socci. The Prelate merely says “the cinematographic reconstructions of the envelope hidden in the desk of the Pope are pure fantasies,” but provides no evidence except his own testimony. Bertone goes on to ridicule the idea that the Secret speaks of “apostasy” in the Church. Yes, really. He did it all of the time. Precisely so as “to place the modern world in contact with the life-giving and perennial energies of the Gospel” (John XXIII, Apostolic Constitution Humanae Salutis, 3), the Second Vatican Council was convened. There the Church, on the basis of a renewed awareness of the Catholic tradition, took seriously and discerned, transformed and overcame the fundamental critiques that gave rise to the modern world, the Reformation and the Enlightenment. In this way the Church herself accepted and refashioned the best of the requirements of modernity by transcending them on the one hand, and on the other by avoiding their errors and dead ends. The Council laid the foundation for an authentic Catholic renewal and for a new civilization – “the civilization of love” – as an evangelical service to man and society. This is the talk of Antichrist. Does the "Second" Vatican Council represent a "renewed awareness of the Catholic tradition"? Did it "accept and refashion the best of the requirements of modernity by transcending them on the one hand, and on the other by avoiding their errors and dead ends? Did the "Second" Vatican Council lay the "foundation for an authentic Catholic renewal and for a new civilization--'the civilization of love'--as an evangelical service to man and society"? Is not Modernity opposed to the Social Reign of Christ the King and the separation of Church and State? So are the conciliarists. Is not Protestantism opposed to the Social Reign of Christ the King and the separation of Church and State? So are the conciliarists. Do not the lords of Modernity embrace religious liberty? So do the conciliarists. Do not Protestants believe that it is necessary to "search for the truth"? So do the conciliarists. While, as Pope Leo XIII noted in Testem Benevolentiae Nostrae, January 22, 1899, Holy Mother Church rejects nothing that is good and true in the world, she wants everyone in the world to subordinate all of their activities to the Deposit of Faith and to undertake them for the honor and glory of the Most Blessed Trinity, it is nevertheless true that the Catholic Church does not have to "search for truth." (See Living In A World Of Needless Searches.) She is sacred repository of the Deposit of Faith. The chief stimulus of the evolution of worship consists in the need of accommodation to the manners and customs of peoples, as well as the need of availing itself of the value which certain acts have acquired by usage. Finally, evolution in the Church itself is fed by the need of adapting itself to historical conditions and of harmonizing itself with existing forms of society. Such is their view with regard to each. And here, before proceeding further, We wish to draw attention to this whole theory of necessities or needs, for beyond all that we have seen, it is, as it were, the base and foundation of that famous method which they describe as historical. "By right, for it is in the very nature of authority to protect tradition: and in fact, since authority, raised as it is above the contingencies of life, feels hardly, or not at all, the spurs of progress." Does Jorge Mario believe this? "Now it is by a species of covenant and compromise between these two forces of conservation and progress, that is to say between authority and individual consciences, that changes and advances take place. The individual consciences, or some of them, act on the collective conscience, which brings pressure to bear on the depositories of authority to make terms and to keep to them." Is this an accurate description of what Ratzinger/Benedict called his "hermeneutic of continuity"? Moreover, Jorge Mario Bergoglio has given his unquestioned support for the "movements," which he believes should be left alone by the Roman dicasteries to let the "spirit" lead them according to their particular "charisms." In the face of this effort to deconstruct the Fatima Message so as to deflect attention from conciliarism's apostasies and errors we must be ever steadfast in its promotion. Our Lady gave Saint Dominic de Guzman her Most Holy Rosary in 1208 to be the chief weapon, after the offering of the Holy Sacrifice of the Mass itself, against the Albigenses heresy. It remains Heaven's chief weapon to help us combat the power of the world, the flesh, and the devil in our own lives as well as to win the conversion of apostates and infidels and schismatics and heretics to the true Faith. We are dealing with forces at present that are preternatural. We are not going to "will" ourselves out of the apostasies of the moment. We are not going to "vote" ourselves out of the present chastisement. While a given article here and there might help one or two souls now and again, we have to recognize that any and all efforts, whether spoken or written, to combat the apostasies of the day, will come to nothing if they are not undergirded by the rock solid foundation of assisting at the daily offering of the Immemorial Mass of Tradition, offered by priests who make no concessions to conciliarism or to its false shepherds, profound Eucharistic piety, and deep, tender devotion to the Mother of God by means of Total Consecration to her Divine Son through her own Sorrowful and Immaculate Heart and by the reverent praying of her Most Holy Rosary each and every day without fail. Our efforts to form our own families so as to keep them unspotted by the world and unspotted by the apostasies of conciliarism will come to nothing if we fail to remember the promises of Sacred Heart of Jesus revealed to Saint Margaret Mary Alacoque and thus fail to keep the Nine First Fridays. Our efforts to seek the restoration of the Social Reign of Christ the King are fruitless if we do not keep the Five First Saturdays, spending at least fifteen minutes in prayer before the Blessed Sacrament as we truly meditate upon the mysteries contained in Our Lady's Most Holy Rosary. Our efforts to convince others that the "modern church" is not the Catholic Church will be less effective if we do not accuse ourselves on a regular (weekly) basis in the Sacred Tribunal of Penance, resolving after we have received Absolution from an alter Christus acting in persona Christi to live more penitentially, giving all of our sufferings and those of the Church Militant on earth to the Most Sacred Heart of Jesus through the Sorrowful and Immaculate Heart of Mary. 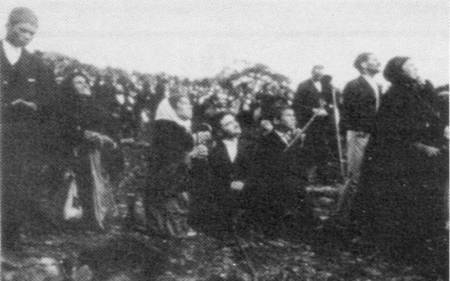 We must, however, be people who are on fire for our love of the Rosary, which Our Lady stressed in Fatima is a principal means to save our own souls and to help to convert other poor sinners and thus to save them from the fires of Hell that she had shown to Jacinta, Francisco and Lucia on July 13, 1917. Our Lady told Francisco that he would have to pray many Rosaries to get to Heaven. Francisco Marto, mind you! And we must convince more and more of our friends and acquaintances to pray the Rosary. Our Lady wants this. So does her Divine Son. Later on, when these trials were over, thanks to the mercy of God, our Lady told Blessed Alan[de la Roche] to revive the former Confraternity of the Holy Rosary. Blessed Alan was one of the Dominican Fathers at the monastery at Dinan, in Brittany. He was an eminent theologian and a famous preacher. Our Lady chose him because, since the Confraternity had originally been started in that province, it was fitting that a Dominican from the same province should have the honour of re-establishing it. Joseph Ratzinger/Benedict XVI mentioned the Rosary, including, of course, the "luminous mysteries," precisely once during his pilgrimage to Portugal in 2010. Once. Even unlike his conciliar predecessor, the very man who deconstructed the Rosary, Karol Wojtyla/John Paul II, who did preach about the Rosary quite a lot, Ratzinger/Benedict did not do so unceasingly. He rarely mentioned it at all. He did so in only one talk during his visit to Portugal, after he had led a recitation of the Rosary. His words were perfunctory, having nothing of beauty or fervor of those found in Pope Leo XIII's many encyclical letters on the Rosary (see Adiutricem, Augustissimae Virginis Mariae, Diuturni Temporis, Fidentem Piumque Animum, Iucunda Semper Expectatione, Laetitiae Sanctae, Magnae Dei Matris, Octobri Mense, Superiore Anno, Supremi Apostolatus Officio, and Vi E Ben Noto). Please, we don't need any more jokers out there right now as most of the jokers in the counterfeit church of conciliarism are putting on a really "good shew," to quote the late Edward Vincent Sullivan, in the Aula Paolo Sicko now. The practice of praying the Rosary was lost between the time of the Fourteenth and the Fifteenth Centuries. Our Lady gave the Rosary to Saint Dominic, who used it to crush the Albigenses heresy. She told Father Alan de la Roche to re-establish the Confraternity of the Holy Rosary in the year 1460, just one hundred one years before the Battle of Lepanto. We must use this great weapon to fight the errors of Russia today, among which are quite indeed the errors of conciliarists that can trace many of their roots to Orthodoxy and those of the "pro-Luther," if you will, Photius. What did Pope Leo XIII recommend to combat the evils of society? But men of carnal mind, who love nothing but themselves, allow their thoughts to grovel upon things of earth until they are unable to lift them to that which is higher. For, far from using the goods of time as a help towards securing those which are eternal, they lose sight altogether of the world which is to come, and sink to the lowest depths of degradation. We may doubt if God could inflict upon man a more terrible punishment than to allow him to waste his whole life in the pursuit of earthly pleasures, and in forgetfulness of the happiness which alone lasts for ever. It is from this danger that they will be happily rescued, who, in the pious practice of the Rosary, are wont, by frequent and fervent prayer, to keep before their minds the glorious mysteries. These mysteries are the means by which in the soul of a Christian a most clear light is shed upon the good things, hidden to sense, but visible to faith, "which God has prepared for those who love Him." From them we learn that death is not an annihilation which ends all things, but merely a migration and passage from life to life. By them we are taught that the path to Heaven lies open to all men, and as we behold Christ ascending thither, we recall the sweet words of His promise, "I go to prepare a place for you." By them we are reminded that a time will come when "God will wipe away every tear from our eyes," and that "neither mourning, nor crying, nor sorrow, shall be any more," and that "We shall be always with the Lord," and "like to the Lord, for we shall see Him as He is," and "drink of the torrent of His delight," as "fellow-citizens of the saints," in the blessed companionship of our glorious Queen and Mother. Dwelling upon such a prospect, our hearts are kindled with desire, and we exclaim, in the words of a great saint, "How vile grows the earth when I look up to heaven!" Then, too, shall we feel the solace of the assurance "that which is at present momentary and light of our tribulation worketh for us above measure exceedingly an eternal weight of glory" (2 Cor. iv., 17). Here alone we discover the true relation between time and eternity, between our life on earth and our life in heaven; and it is thus alone that are formed strong and noble characters. When such characters can be counted in large numbers, the dignity and well-being of society are assured. All that is beautiful, good, and true will flourish in the measure of its conformity to Him who is of all beauty, goodness, and truth the first Principle and the Eternal Source. We are in a figurative Battle of Lepanto at present, dealing with preternatural forces that appear to vastly outnumber those who have chosen, despite their own sins and failings, to remain faithful to the authentic patrimony of the Catholic Church and have rejected such abominations as the Protestant and Masonic Novus Ordo liturgical service and the "luminous mysteries" (how do the 150 Psalms fit into the the number 200? what, as a reader reminded me, is "one third" of a Rosary consisting of 200 Hail Marys? Sixty-six point six; got it?) and the new ecclesiology and ecumenism and religious liberty and separation of Church and State. We are hated by our own former friends and colleagues and by many of members of our own families. None of this matters if we care to unite ourselves to the Mercies of the Most Sacred Heart of Jesus through Our Lady's Most Holy Rosary, giving each Rosary we pray to the Sacred Heart through the Immaculate Heart of Mary as her consecrated slaves. Although we should note with sadness the ceaseless (and ceaselessly clumsy and transparent) efforts of the conciliar revolutionaries to deconstruct Our Lady's Fatima Message, we must never be discouraged or disconsolate. Never. We are Catholics, not brooding or sappy sentimentalists. The final victory belongs to the Immaculate Heart of Mary. We can plant the seeds for this victory by our daily fidelity to Our Lady's Most Holy Rosary. And, my friends, praying the Rosary is not being inert or passive in the midst of our state of apostasy and betrayal! We must make sure not to be in league with the Mayor of Ourem, Portugal, Artur de Oliveira Santos, who held the Fatima children captive in August of 1913, and those who are in league with him in the counterfeit church of conciliarism, who hold all truth captive, including that of the Fatima Message, in order to promote their lies. As we seek refuge from the conciliar revolutionaries in the catacombs with true bishops and true priests, may we always prove ourselves to belong to God by praying and propagating the Most Holy Rosary of His Most Blessed Mother. First, as Vatican Secretary of State, Cardinal Sodano is literally the most powerful figure in the Church today, given the reorganization of the Roman Curia under Pope Paul the Sick; and, as such, Cardinal Sodano is the de facto rule of the daily affairs of the Church, especially given the failing health of the Supreme Pontiff. Second, owing to the same curial reforms of Pope Paul the Sick, Cardinal Sodano stands at the head of every Vatican dicastery, including the Congregation for the Doctrine of the Faith (CDF), which (when it was called the Holy Office) was formerly headed by the Pope. it was Cardinal Sodano's "interpretation" of the Third Secret that was cited no fewer than four times in the CDF's commentary The Message of Fatima (TMF). Cardinal Sodano took control of the "interpretation" of the Third Secret and its false reduction to a thing of the past, along with the rest of the Fatima Message. One day after the publication of TMF, Cardinal Sodano pointedly demonstrated his adherence to the new orientation by inviting Mikhail Gorbachev, the pro-abortion, ex-Soviet dictator, to the Vatican for a bogus "press conference" (no questions allowed), during which Cardinal Sodano, Gorbachev and Cardinal Silvestrini sat together to heap praise on a key element of the new orientation, developed by Cardinal Sodano's predecessor, Cardinal Cassaroli, namely, Ostpolitik, under which the Church "dialogues" with Communist regimes rather than opposing them, and observes diplomatic silence in the face of Communist persecution of the Church. Cardinal Sodano's representative, Cardinal Cassidy, negotiated the Balamand Declaration (1993) which declares that the return of the Orthodox to Rome is "outdated ecclesiology"--as is, therefore, (according to Cardinal Sodano) the conversion of Russia to the Catholic Faith called for by Our Lady of Fatima. . . .
First, Cardinal Ratzinger, in his capacity as head of the CDF, has on innumerable occasions stated his commitment to the new orientation of the Church, which he described as "demolition of bastions" in a book published after he had become head of the CDF. Second, in accordance with this "demolition of bastions", Cardinal Ratzinger has openly declared his view that Blessed Pius IX and St. Pius X were "one-sided" in their solemn, infallible condemnation of liberalism, and that their teaching was "countered" by Vatican II. He further declares that the Catholic Church no loner seeks to convert all the Protestants and schismatics, and that it is no right to "absorb" their "churches and ecclesial communities," but must make a place for them in a "unity of diversity"--a view that is obviously irreconcilable with the consecration and conversion of Russia to the Catholic Faith. Cardinal Ratzinger's view is, to say the least, suspect of heresy. Third, one of the "bastions" Cardinal Ratzinger has sought to "demolish" is the traditional Catholic understanding of the Message of Fatima. Fourth, Cardinal Ratzinger sought to demolish the bastion of Fatima in TMF, which he published under the control of Cardinal Sodano. Cardinal Ratzinger removed the words "in the end" from the Virgin's prophecy "In the end, My Immaculate Heart will triumph." Cardinal Ratzinger also cropped the immediately following words from the Fatima prophecy: "The Holy Father will consecrate Russia to Me, and it will be converted, and a period of peace will be granted to the world. Having deliberately tampered with the words of the Mother of God, Cardinal Ratzinger then declared that the (predicted future) Triumph of the Immaculate Heart means only Mary's fiat, 2,000 years ago, in consenting to be the Mother of the Redeemer. Cardinal Ratzinger thus deliberately ignored the Virgin's prophecy of four future events surrounding the consecration and conversion of Russia, and deliberately reduced them all to one event--Her fiat in 1 B.C. Concerning devotion to the Immaculate Heart, which Our Lady of Fatima announced that God wills to establish in the world, Cardinal Ratzinger dared to say that devotion to the one and only Immaculate Heart of Mary means nothing more than following Mary's example by achieving an "immaculate heart" of one's own, through "interior unity" with God. By means of this grotesque and blasphemous "interpretation," Cardinal Ratzinger debases the Mother of God Herself in order to sever any link between devotion to the Immaculate Heart in the world, and Our Lady of Fatima's call for the conversion of Russia to the Catholic religion, which must precede true devotion to the Immaculate Heart in that nation since the Russian Orthodox religion does not recognize the dogma of the Immaculate Conception. Sixth, Cardinal Ratzinger, following Cardinal Sodano's Party Line, stated in TMF that "we must affirm with Cardinal Sodano: ...the events to which the third part of the 'secret' of Fatima refers now seem part of the past", and (according to Cardinal Sodano's "interpretation") that the Third Secret culminated with the failed assassination attempt in 1981. Seventh, in adopting the Sodano Party Line on the Third Secret, Cardinal Ratzinger flatly contradicted his own testimony in 1984--three years after the assassination attempt--that the Third Secret is a "religious prophecy" concerning "dangers to the faith and the life of the Christian, and therefore the world", on which occasion Cardinal Ratzinger made no suggestion that the Secret pertained to the 1981 assassination attempt or any other past event. Eighth, in furtherance of the Party Line, Cardinal Ratzinger went out of his way to criticize Father Nicholas Gruner at the press conference of June 26, 2000, advising the world press that Father Gruner "must be submissive to the Magisterium" and accept the alleged 1984 consecration of the world as a consecration of Russia. That is, according to Cardinal Ratzinger, Father Gruner must submit to Cardinal Sodano's Party Line. Cardinal Ratzinger's claim is false because there has been no binding, authoritative pronouncement of the Magisterium--not the Pope, not a Council, not the Ordinary and Universal Magisterium. June 26, 2000 - At a press conference, the Vatican publishes a text it claims is the entire Third Secret. The text describes a vision in which the Pope (a "bishop in white") is killed by a band of solders who shoot him down while he is kneeling at the foot of a large wooden cross atop a hill, after having traversed a half-ruined city filled with corpses. The execution of the Pope is followed by the execution of many bishops, priests and laity. Questions abound. (See article by Andrew Cesanek in The Fatima Crusader, Issue No. 64.) Among those questions is why the published vision contains no words of Our Lady, even though, when it announced suppression of the Secret in 1960, the Vatican itself referred to "the words which Our Lady confided to the children as a secret." The vision fails to mention the words which clearly follow. "In Portugal the dogma of the Faith will always be preserved etc." --the phrase Sister Lucy included in her fourth memoir as part of the integral text of the Third Secret of Fatima. The phrase concerning the dogma of the Faith in Portugal is mysteriously demoted to a footnote in the Vatican commentary on the Secret, where it is ignored by both Cardinal Ratzinger and Msgr. Bertone, the co-authors of the commentary. Cardinal Ratzinger's portion of the commentary specifically states that he and Msgr. Bertone are following the "interpretation" given by Cardinal Sodano: i.e., that the Message of Fatima, and the Third Secret in Particular, relates entirely to events which now belong to the past. Accordingly, Cardinal Ratzinger claims that the Pope's escape from death in 1981 is what is depicted in the vision of the Pope being killed. Even the secular media recognize the falsity of this interpretation. The published text of the vision contains none of the elements described by Cardinal Ratzinger in his mysteriously censored 1984 interview in Jesus magazine. The published vision says nothing about "dangers threatening the Faith and the life of the Christian and therefore of the world", nothing about "the importance of end times", nothing about what is contained "in many other Marian apparition" approved by the Church and nothing about prophecies "announced in Scripture". Further, while Cardinal Ratzinger said in 1984 that the Third Secret contains "religious prophecy:"--a statement he made three years after the attempt on the Pope's life--he will now claim that there is no prophecy, but only a description of past events, culminating in the 1981 assassination attempt. Further, Cardinal Ratzinger's commentary scandalizes the faithful by claiming that the triumph of the Immaculate Heart of Mary is nothing more than love conquering bombs and guns, and that devotion to the Immaculate Heart means nothing more than each person doing God's will and thus acquiring an 'immaculate heart" of his or her own. The conversion of Russia to Catholicism and the spreading of devotion to the one unique Immaculate Heart of Mary throughout the world are not even mentioned in Cardinal Ratzinger's commentary. More than the Vatican’s "top theologian" were involved in this public insult to the Catholic faithful, and public insult to the Mother of God. One of the glories of the new book is that it names and thoroughly explores the roles played by each of the four prelates who are quite rightfully lined up as an anti-Fatima cabal. They are Cardinal Angelo Sodano, Cardinal Joseph Ratzinger, Archbishop Tarcisio Bertone and Cardinal Dario Castrillón Hoyos. These prelates have colluded to stifle the Mother of God, to silence Sister Lucy, to obscure the Message of Fatima and to promote a new Church that stands in opposition to all of Catholic Tradition. They deserve to be exposed; they should be forced to answer to the Catholic faithful even before they stand before their Maker and are made to answer to Him. Their opposition puts both world peace and millions of souls in peril.